Born and educated in Hong Kong, Peter has been working as a full-time artist in Toronto since 1996. He was one of the founding members and former instructor at the Hong Kong Institute of Visual Art In Hong Kong. 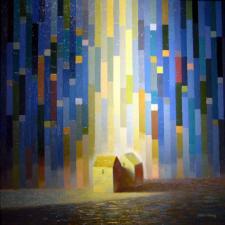 Peter has won numerous awards for his works in advertising and oil painting. A strong background in graphic design has led him to develop a style of painting that is rich in color and reveals a strong balance of form and composition. Peter's previous work's subject matter ranged widely from traditional still-lifes to various landscapes and figuratives. Now Peter paints houses to represent people. The houses always have small windows as eyes and without doors to signify modern man's need for privacy. The paintings with two houses represent lovers; with big and small houses as families and many houses as relatives and friends to suggest people living in harmony with one another. As lovers, one house is shadowing -protecting- the other as sign of wellingness to sacrifice for love. 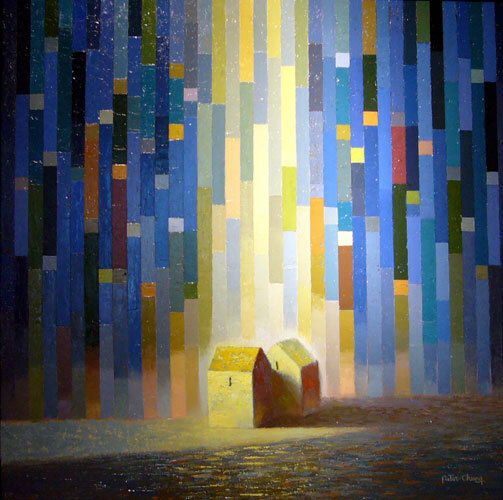 The paintings sometimes have dark and disturbed backgrounds to suggest turmoil in life that we have to face in order to grow stronger, or peaceful backgrounds with graphics telling stories of the houses, such as: squares are like photo-frames now framing memories of the houses;circles or stripes are flashes of memories or timeline and sparkles are energies their positive happy mode generated. A rewarding light shines on the houses to represent a blessing for their love and celebration of a happy life!